What a great response I had to the Sew News magazine give away. 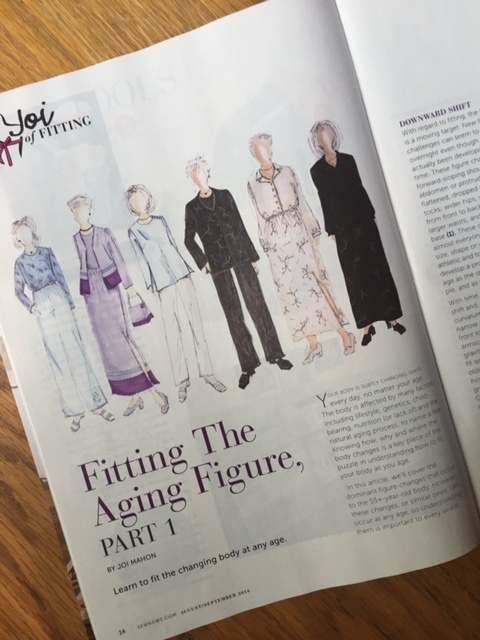 It seems that many of you are especially interested in the "Fitting The Aging Body" article by Joi Mahon. A little side story. I had a wonderful friend who sadly passed away a few years ago. She was considerably older than me, but we had so much in common. When she was in her 80's, she one day shared that she wasn't remembering things the way she did when she was in her 20's. My reply was that when she was in her 20's, she didn't have as much to remember :) My comment really made her feel so much better. Okay, so get off my soapbox :), and announce the winners!!! Be sure to email me at sewbussted@yahoo.com with your mailing info so I can get your magazines off to you. In case you missed yesterday's post, I'm so fortunate to be able to offer another give away, the Evelyn Handbag and Market Tote pattern from Swoon Patterns. If you would like a chance to win, be sure to pop over to THIS post and leave a comment. Have a wonderful day! I'm off to give a sewing lesson to our student that we are hosting this week.She's super excited :) I'm so happy! It's A Lollapalooza Kind Of A Week! Today is actually the kickoff of the huge Lollapalooza concert extravaganza here in Chicago. If I'm not mistaken, I think they said that there will be over 100,000 attending the concert and tickets are completely sold out. It's kind of a Woodstock experience for those of you old enough to know what Woodstock was ;) I will not be attending. Huge outdoor concerts where anything can happen is just a little more than I can deal with. So what's the connection with the blog today? Well, nothing really, but it's a crazy giveaway week!!! 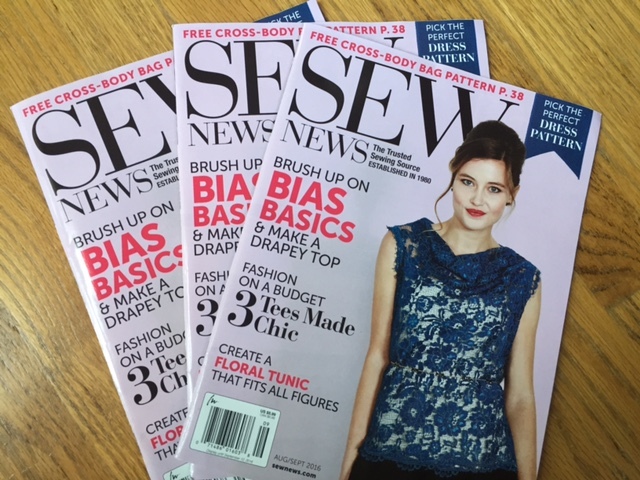 Quite a few have thrown their name in to win a copy of the brand new issue of Sew News magazine. I'm drawing the winning names tomorrow, so be sure to pop over to THIS post if you would like an opportunity to win 1 on the 3 magazines that I have to give away. In the new issue of Sew News, you can also see the Swoon Patterns Stella Weekender Bag that I made for the upcoming sew along that will begin in September. 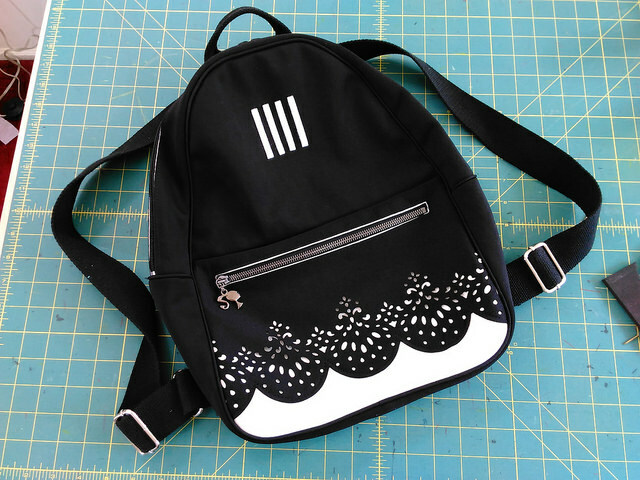 When I initially contacted Alicia, the designer of Swoon Patterns, about her bag being considered for a sew along article, she was SOOO excited. Rather than send me just the pattern for the Stella Weekender Bag, she sent 2 others that she thought I might like. The first is the Evelyn Handbag and Market Tote. There are 2 bag sizes included in the pattern. Here are the specifics of the pattern and the supply list. Now for the good news!!! Alicia would like to give away an Evelyn Bag pattern to one of you. How generous! So just leave a message on this post and let me know that you would like to be considered. I will draw the winning name next Monday, August 1, 2016. I'll have my construction of the bag up on the blog next week, so you can take a look prior to making your own. I'm Coming Out Of Retirement, Wedding Gown Retirement That Is! I've designed and made more wedding gowns than I can count! Working with brides was such a wonderful experience. Many have asked me how I could deal with so many brides. As it turns out, the brides were great, the bridesmaids were a different story. I had one bridesmaid who was especially difficult. At one point I said, "your title in this wedding is bridesmaid, and the emphasis is on maid and not bride." The bride later told me who grateful she was that I spoke up. I loved being a part of such a special day. More often than not, I would at least see them down the aisle. What a joy it was to spread out their train, open the doors and see them take that first step toward a new future. After twelve years, I realized that I either needed to expand my business, or close my door. At the time, my husband really needed me to take over his responsibility in our family business, so the decision was easy. My niece is getting married in October. Now the truth of the matter is that she is really not my niece, a family member, but really quite removed. She's the granddaughter to my husband's brother-in-law's sister. How's that for a brain teaser?!! She's held a special place in my heart since she was just a little girl. When she was 8 years old, she told me that she wanted to one day live in my house. I think we are kindred spirits. She like me has a deep respect for family heirlooms and antiques in general. When she told me that she was getting married, I could not have been more excited than if she were my own daughter. She wasn't sure about her dress, but she did want me to create it. A few weeks ago, we visited to a small bridal shop in a quaint little town outside of Chicago. My husband had taken me the week before to visit a few antique stores. While we were there I just happened to look through the window of a bridal shop and saw a gown that I thought my niece might like. As it turned out, she did not like the dress, but we found a style that was amazing on her. The back is so pretty. She doesn't want a train, and no beaded details, just sleek and sophisticated. She would also like the dress to be a non-traditional color, maybe a deep blue. She has a set of antique jewelry pieces that belonged to her grandmother who sadly passed away a few years ago. She would really like to wear the pieces and they will look especially rich against a darker color. Rather than pretty, inspiring pictures this morning, I thought I would share a video that I found especially interesting. It's about the textile manufacturing industry here in America, and primarily the state of North Carolina. For a period of time, my family lived in rural Mississippi when I was growing up. Many in the community worked at a local mill. They took great pride in what they produced. Sadly, as manufacturing went over seas, the jobs were lost. So many in the sewing community are trying to be responsible with what they wear, taking the "no purchasing of ready to wear pledge," or just simply taking pride in what they have made by joining in on Me Made May. Pictures like the one below stir mixed emotions. A child laboring away, while consumers take advantage of an incredible price tag. In the documentary, you'll learn about an energetic young woman who began manufacturing her clothing line in Sri Lanka, but as she grew, realized that it was more profitable to bring the manufacturing back to America. 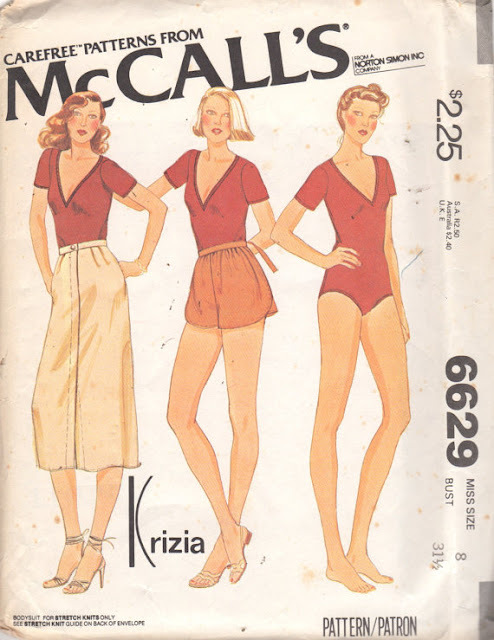 And I think that like me, you will fall in love with 2 older ladies who after being laid off, bought World War II era knitting machines and became entrepreneurs, knitting socks, 1 pair every 9 minutes. For all those who say something can't be done, take a look at Raleigh Denim, handcrafted in North Carolina. Not only are they creating jeans, they are creating jobs and pride. Last March, I posted the video below entitled The Last Pattern Maker. You get a glimpse of her in the above video on Raleigh Denim. She is amazing! She has been an integral part of the success of Raleigh Denim. One aspect that I especially appreciated in all of the video documentaries is the coming together of young and old, or maybe I should just say older :) Sara Blakely created Spanx, and thanks to her success, 100s of manufacturing jobs were created. The founders of Raleigh Denim had a dream, but it took and 82 year old craftsman to bring about success. Two women who only knew how to knit socks, took their knowledge and made a dream come true. Suffering has value. We avoid it at all costs, and we would never want to go back and repeat it. But, it does have value. It's a part of life, and no one gets through life without suffering. No one. The question is, what do you allow it to do in you? 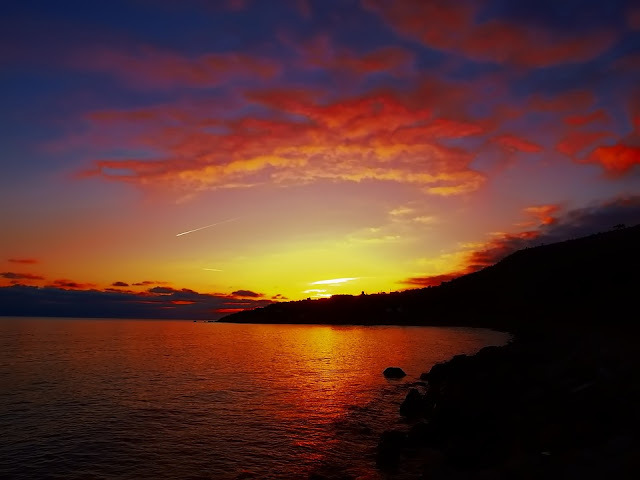 You can allow that suffering to make you bitter, angry, to eat away at your soul, Or you can look for the deeper meaning, the lesson to be learned. In the end, you get to keep the lessons and the pain goes away. 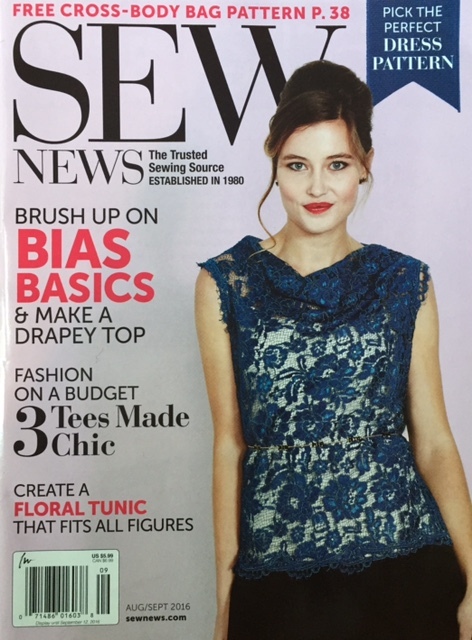 The New Issue of Sew News Magazine and Your Chance To Win a Copy! There's a great article on fitting the aging figure from Joi Mahon. We all want our garments to be beautifully finished. 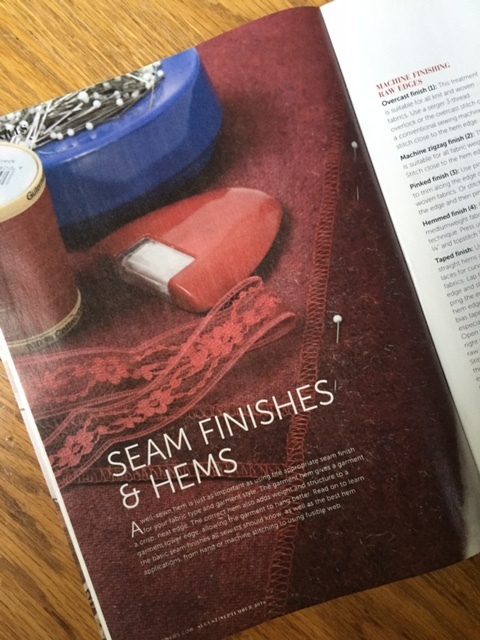 This article covers seam finishes as well as hemming. 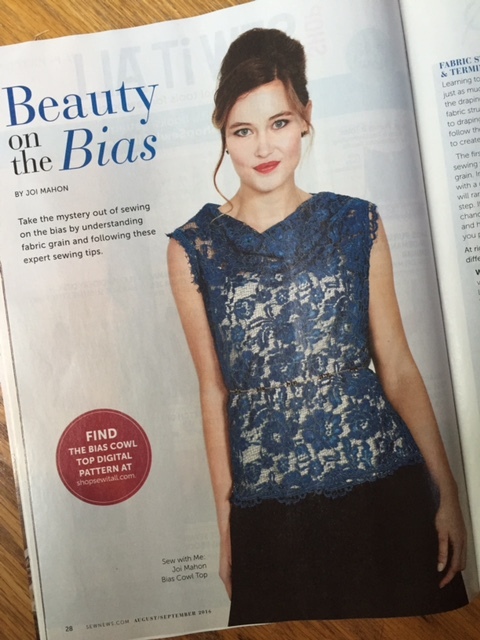 So many of you enjoyed the Magic Bias dress from Fashion In Harmony. 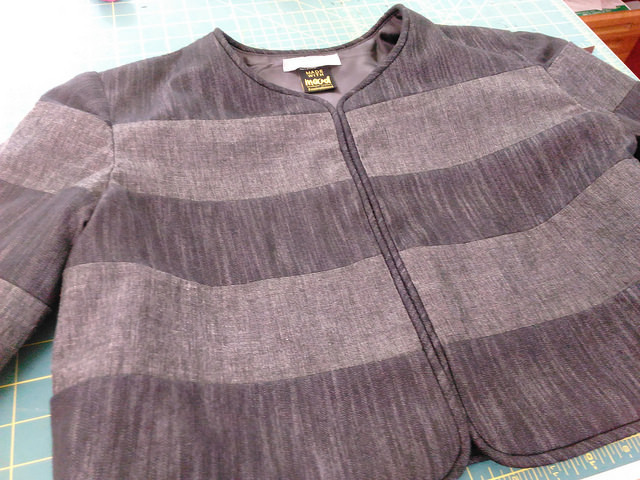 With this article you'll continue to expand your knowledge of working with bias cut garments. You can find the pattern for the Bias Cowl Top HERE. Through September 30, 2016, this fabulous Messenger Bag pattern is FREE!!! What a great back to school gift this would make. You can download the free pattern HERE. 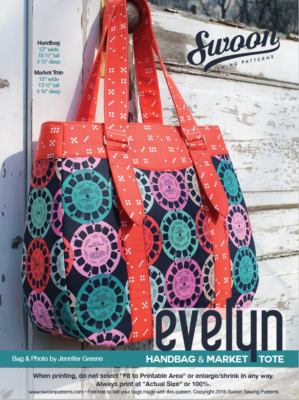 And finally, the featured sew along that I will be doing, a fabulous bag from Swoon Patterns. If you've never heard of Swoon Patterns, you are in for a treat. So many great bag patterns. This is the Stella Weekender Bag. The picture doesn't really do the bag justice. I'll do another post soon and go over the details of the bag and give you a better idea of the size. It has a little of the old fashioned train case feel, kinda sorta. I have 3 magazines to give away!!! If you would like a chance to win, just leave a message on this post. I'll announce the winners on Friday, July 29, 2016. Can You Help Out a Fellow Sewist? 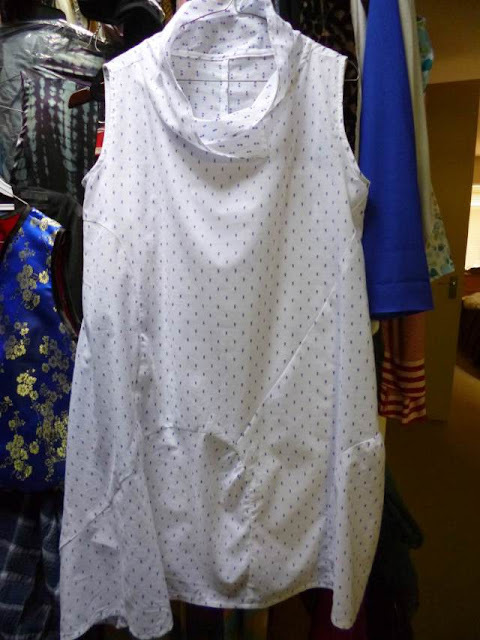 While scrolling through and discovering Sue's Sew By Me blog for yesterday's Wednesday Showcase, I came across this super cute dress that she made. The fabric is pretty sensational too. 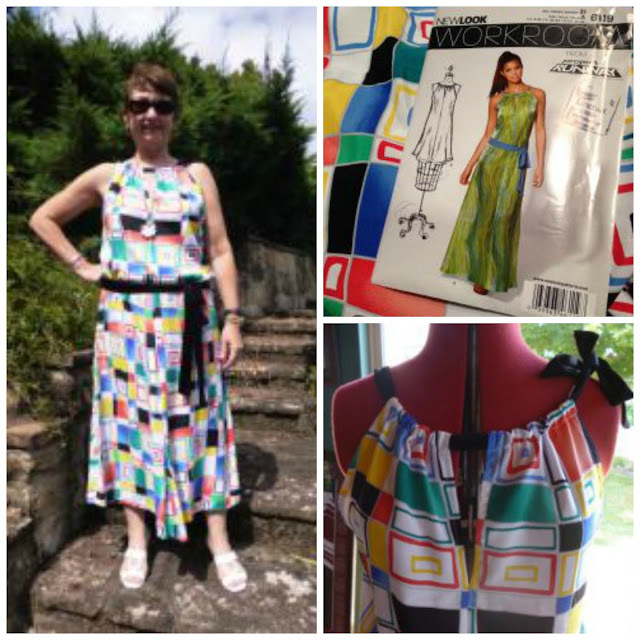 "I had that rayon Mondrian fabric and used it to make my sister a shirt. I wish I had more. If anyone knows where more could be found, I would be a happy gal." If anyone has a link, or knows of a store that is carrying the fabric, just leave a message here and I'll make sure that she gets the message. Before I head out to my garden, I thought I would do a Wednesday Showcase post. I always enjoy doing the posts, but I think I'm also procrastinating a bit, as I really need to get back to my garden and finish the project I started yesterday. I've been a sweaty and dirty mess for days and I'm longing for a break. That will come tomorrow and Friday as it's supposed especially hot, so a little break is in order. First up is Sue of Sue's Sew By Me. She lives in Australia and she began sewing as a teenager, when like so many of us who sew, she longed for the latest styles and sadly didn't have the funds to purchase them. While her children were growing up, sewing took a back seat, but now she is back with a vengeance!!! 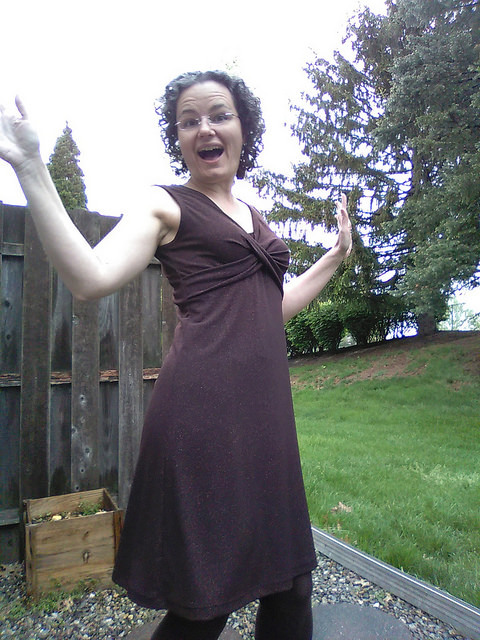 She created this dress to wear to a wedding. Such a wonderful use of a border print, and so very elegant. Sue enjoys wearing artful pieces and making the best use of the fabric. Another great use of a border print with this rectangular top. Love this Marcy Tilton top in the gauzy fabric. I may just have to break down and buy the pattern! I absolutely love this dress. 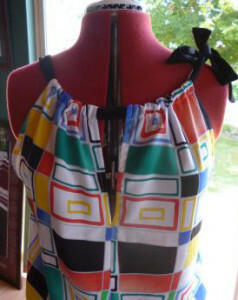 Sue liked the nod to the Mondrian look of the fabric print. I think I would be tempted to wear this dress everyday. 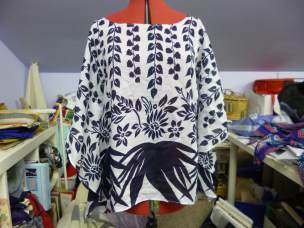 Sue enjoys using a number of the Tessuti patterns, so if you have had your eye on a few, be sure to check out her blog to see them made up. You can also find Sue on Instagram HERE. Next up is Kyle from Vacuuming The Lawn. 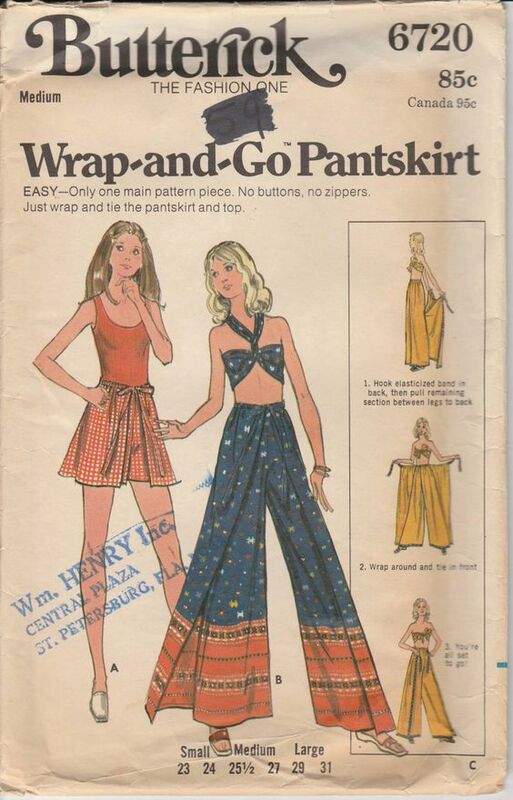 Many of you may know her from Pattern Review. She loves to sew, and she loves taking on a challenge. Doesn't this look like one fun gal!!! Look at how gorgeous this fabric is! What looks like a simple box jacket, is really a work of art. And now you see that this is no typical striped fabric. 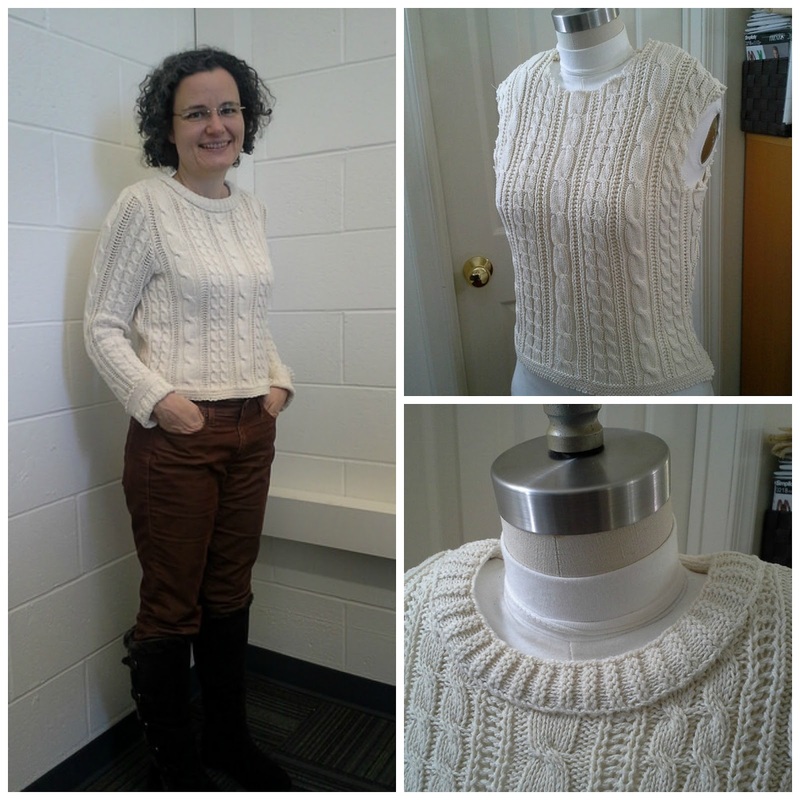 After I saw the pictures below, I thought to myself that I may very well never knit again! She made this sweater from a blanket!!! And finally, I just had to show you this amazing backpack. Check out the cute zipper pull. Be sure to pop over to her blog and read all about it. You can also find Kyle on Instagram HERE. We are having a rather hot summer here in Chicago. In fact, later this week it is supposed to hit the triple digits. Now for those of you who live in super hot climates, you'll probably think, oh boo hoo ;), but we are just not accustomed to the heat and it's not unusual for homes to be without air conditioning. Thankfully, I do. Staying cool and looking great can be a challenge. I always enjoy doing a little people watching when the temperatures soar as the outfits get rather inventive and sadly, far too skimpy. I especially enjoy wearing dresses in the summer. Dresses are the coolest thing you can possibly put on your body, as long as they aren't tight fitting. I came across a lovely blog entitled Living In Yellow. The author is Erin and she has a great sense of style. 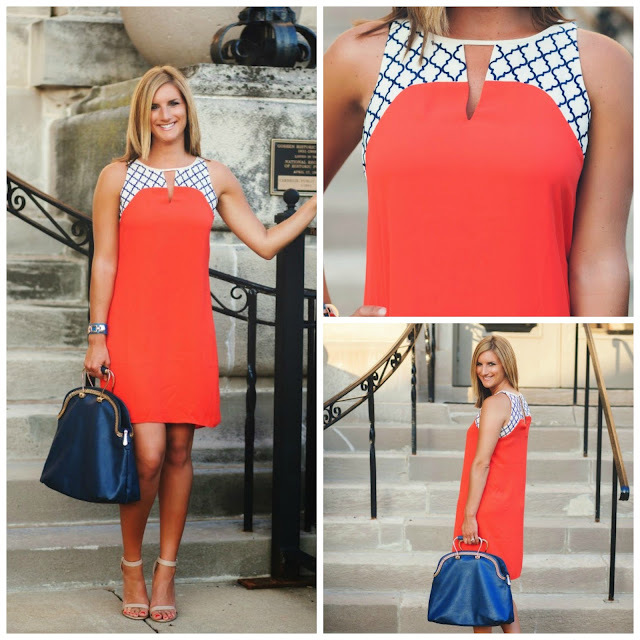 She did not make the dresses, but I loved the color block aspect and the combination of prints. This maxi is so cute with the surprise in the back. Easy to do with a basic t-shirt pattern. Love this little dress. Great idea for a patterned fabric that has a stripe. Turn the stripe and create a border. Another cute idea. 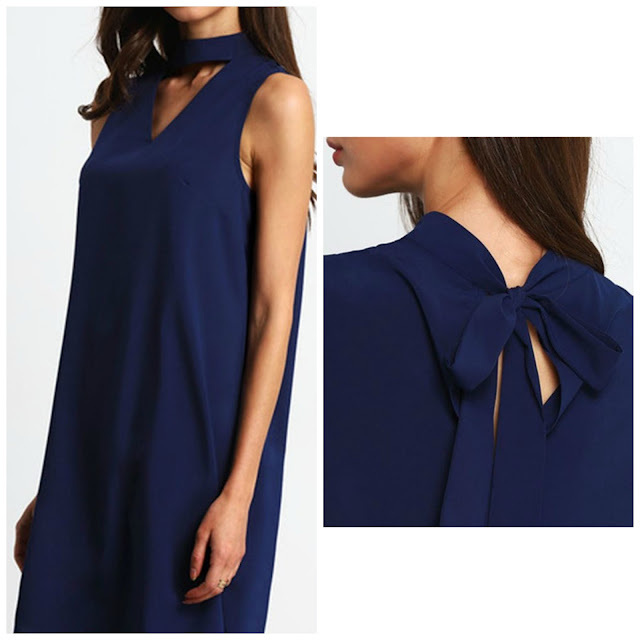 Take a simple dress with a v-neck and add a band to create a loose tie. It will naturally drape at center back. 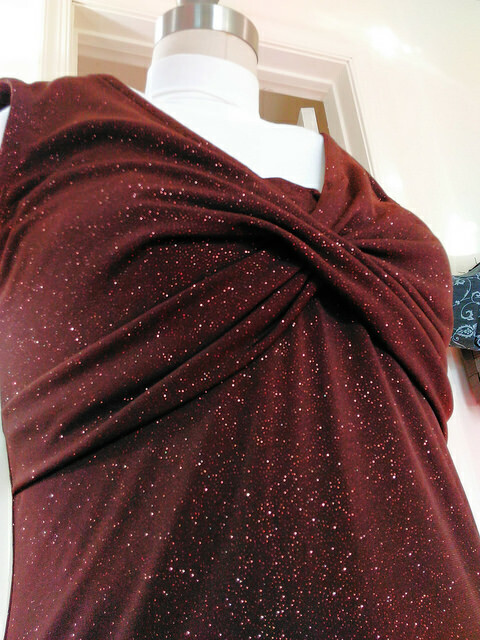 Here's another incredibly easy dress to create. 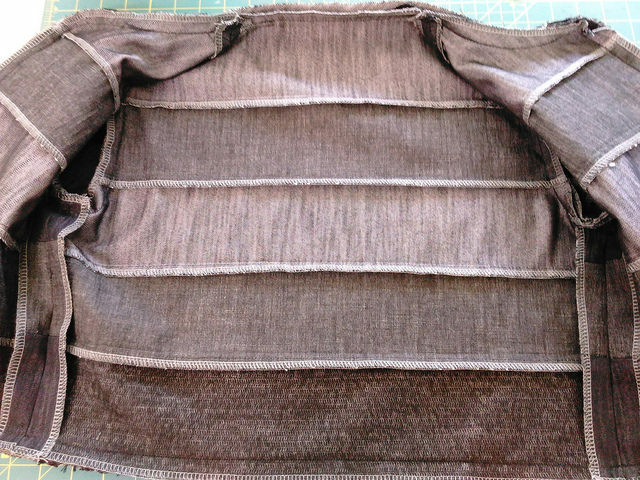 It's very similar to THIS sleeve tutorial I did a few summers ago. 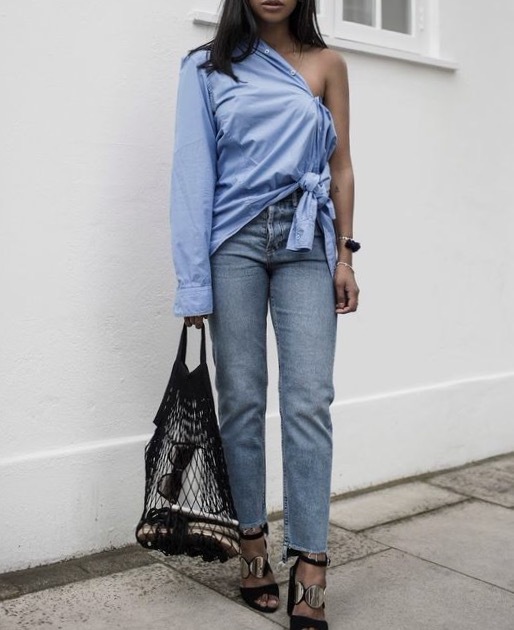 It seems like everyone has embraced the bare shoulder, or cold shoulder look. 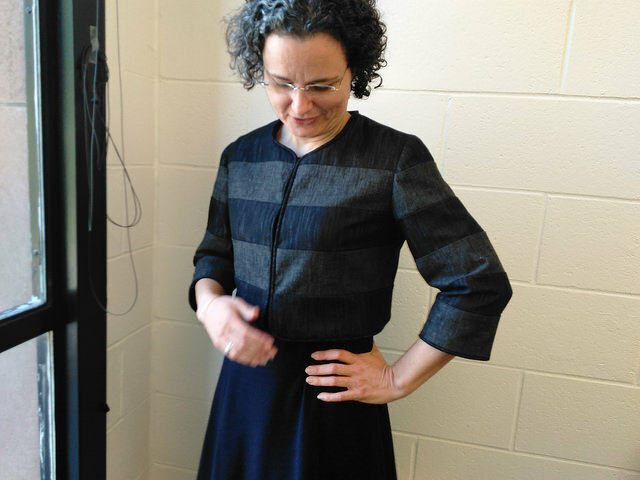 A simple idea for a breezy top is leave slits at center front, center back and the side seams. I don't find shorts to be all that cool, but a cute short is still fun to wear. I love the pattern combination on the left and the applied trim on the right is super cute. Wrap shorts make a comeback every few years. I wore these when I was in high school...and that was not yesterday!!! But, a cute idea then and a cute idea now. 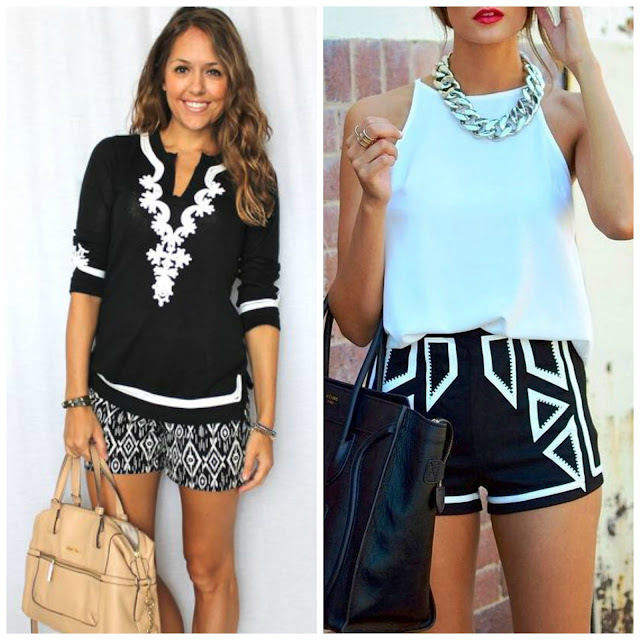 There are so many patterns that you can find for similar shorts. And if you don't want a short, then make a pant, or a longer culotte style. 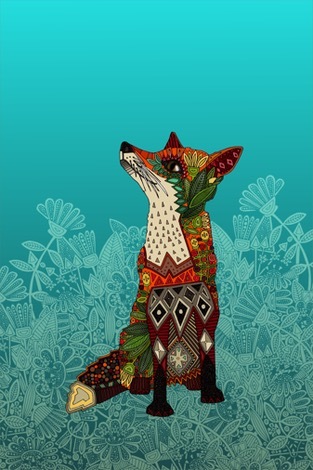 I found the pattern below HERE on Etsy. This is the pattern that I purchased when I was in high school and still love. You can find it HERE, HERE, and HERE on Etsy. And finally, for a little Monday fun, I came across this picture and thought, "you have got to be kidding!" It was labeled, "a great idea." Really? All they did was take a shirt and twist it to the side and use the opposite sleeve to tie it together. Great shoes though!!! Have a wonderful week, and if you are somewhere where it is blazing hot...hope you are able to stay cool! I went to the drug store a few days ago and basically bought out the Epsom salts. My husband picked up the bag of salts that I had in the car and without hesitation exclaimed, "how many pounds of Epsom salt did you buy?!!! My muscles are screaming and I need all the help I can get! With most green type salads, they really need to be made and eaten the same day. Not so with this salad. The kale really holds up, so the salad can be made the day before, and leftovers can be eaten even a few days later. 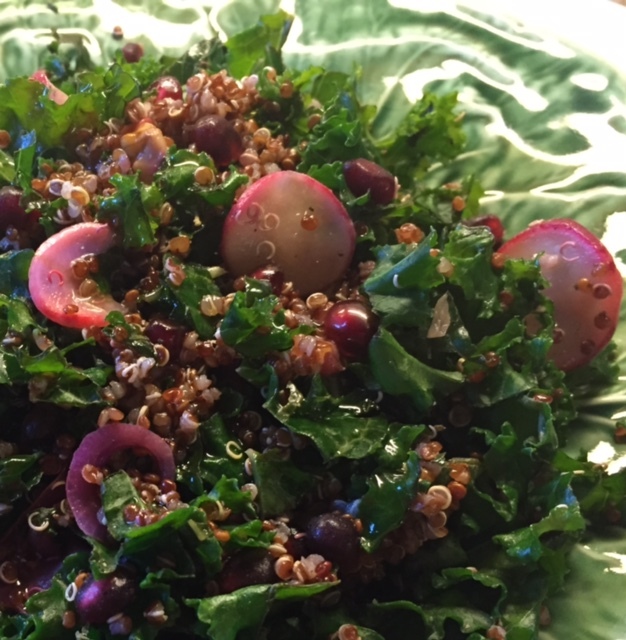 The key to this salad is the dressing that is massaged into the kale. Begin by chopping the garlic clove. Then mash the garlic to form a bit of a paste, but not a complete paste, you want there to still be bits of the garlic. Combine the garlic with the lemon, salt, and olive oil. Set aside. Remove the stems from the kale and then roughly chop. 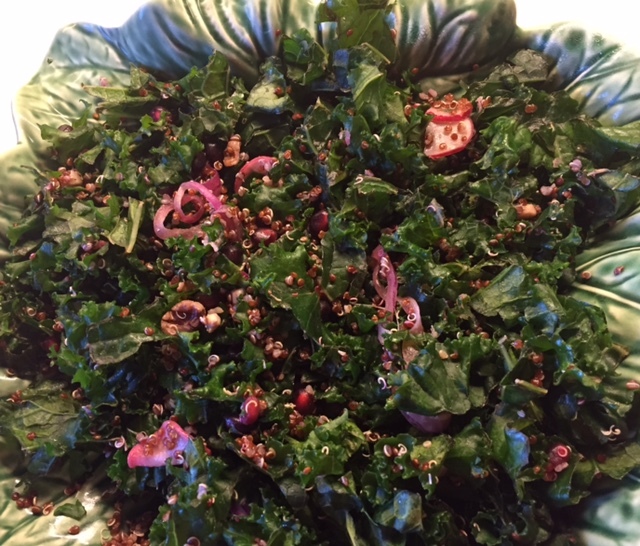 Place kale in a large mixing bowl. Pour the dressing over the kale and then start massaging. Be sure your hands are clean!!! Massage until the kale begins to wilt. This will only take a few minutes. The kale will soften slightly, but will retain its crunch. The result is a hearty, yet light salad that is full of protein. And it's pretty too!!! The lemon juice gives the salad just a bit of a tang and the pomegranate offsets the tang with a touch of sweet. If you give it a try, I hope you enjoy it! Have You Ever Wanted A Dolce and Gabbana Gown?